Today, jQuery is used in over 60% of the one million most-visited websites, and that makes it one of the technologies that every web developer should master. The problem is that jQuery is difficult to learn, even for those with programming experience. But now, this new edition of our jQuery book makes it as easy as possible for students to learn how to use jQuery... at a thoroughly professional level. This book is divided into five sections. After your students complete the first two sections, you can proceed with any of the other sections, in any order that works best for your course. To begin, chapter 5 presents the jQuery selectors, methods, and event methods that are used the most. Then, the next four chapters build on that base as they focus on effects and animations, the many plugins that are available for jQuery, how to create your own plugins, forms and data validation, and DOM manipulation and traversal. When your students complete this section, they can go on to any of the three sections that follow. The jQuery UI (User Interface) library helps you build common but useful features into a website...with just a few lines of code. So this section shows your students how to use jQuery UI to create widgets like tabs, accordions, and datepickers...interactions like draggable, droppable, and sortable...and effects like color and class transitions. So in this section, your students will learn how to use jQuery with Ajax and JSON to deliver data to your websites. First, they’ll learn the basics. Then, they’ll learn how to work with the APIs for websites like Flickr and Google Maps to add popular content to their pages. Last, this section shows how to use HTML5 APIs like Web Storage and Web Workers to enhance Ajax applications. This section shows how to use jQuery Mobile to develop web pages for mobile devices with the look-and-feel of native applications. For large, established sites, this is a practical alternative to responsive web design. And there’s no better way to develop mobile websites than using jQuery Mobile. This book is designed specifically for a jQuery course. If you page through a review copy of this book, we think you’ll see why we believe it is the best book for a jQuery course. In short, it presents all of the features of jQuery, jQuery UI, and jQuery Mobile that are commonly used on the job. And it does that in a way that’s designed to make learning quick and interesting. 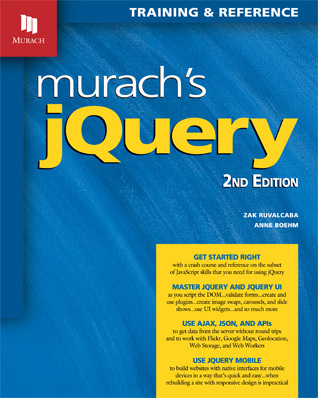 Most important, we updated this book to jQuery 2.0 and fixed the problems that resulted from the changes in version 1.9, which was released after the first edition was published. Dropped the content on Blogger, YouTube, and Twitter because those APIs have been changed so they are no longer easy to access. Added content on HTML5 APIs like Web Storage and Web Workers as they become more prominent. Upgraded, improved, and expanded content throughout to make it more thorough and understandable. To test a web page, your students can use the default browser on their systems. But we recommend that they also test their pages in Chrome, which includes a terrific set of developer tools. Appendix A provides a procedure for installing Chrome, and chapter 4 shows how to use Chrome for debugging. If you aren’t already familiar with the supporting courseware that we provide for a book, please go to About our Courseware. As you will see, our courseware consists of the end-of-chapter activities in the book, the files in the student download at our retail site, and the instructor’s materials. These components provide everything that other publishers provide, in a way that delivers better results.